Maybe it's something with the big map size of the water area. Rebuilding nodes or converting to Hexen format and rebuilding nodes does not help. Making the the water area smaller helps. Update: actually i just moved the 4 vertex involved just a square away in the grid and the problem is gone. 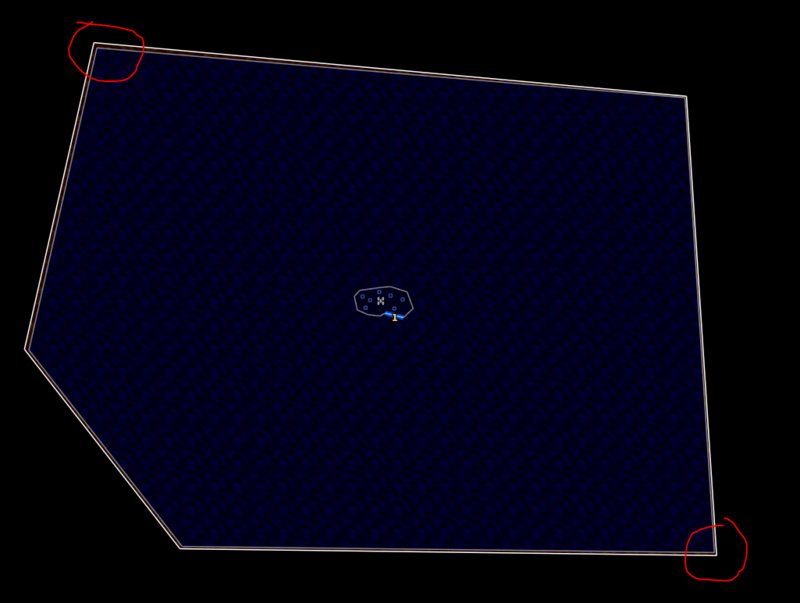 I found the problem is caused by the presence or placement of particular *vertices to the map's west/north-west. I don't know why. What I do know is that when either of these vertices are replaced or deleted, the problem is gone and ZDaemon does not freeze. 4. Play it again with no issue. 5. Undo all edits and play it again (freeze returns). 6. Delete that vertex instead of replacing it. 7. Play it again with no issue. * See Zedek's post - I thought it was just the one vertex causing this. I shifted the other vertex/vertices he mentioned and that also put an end to the freezes. I didn't change the vertices circled bottom-right in his picture though. Maybe it's a combination of area size / line angles / vanilla sky trick that trigger this. The problem is also resolved by deleting the outer sector that causes the sky trick.